– Tonight, we are cosponsoring a County Council District 5 candidates forum hosted by the Coalition of East County Citizens. Hear the candidates talk about their plans for education in District 5, which includes Burtonsville, White Oak, Silver Spring, and Takoma Park. That event will be at 7pm at the East County Regional Services Center, located at 3300 Briggs Chaney Road. – On Saturday, we’ll be at IMPACT Silver Spring’s East County Family Reunion, a free event with food, games, a live DJ, and a basketball tournament. 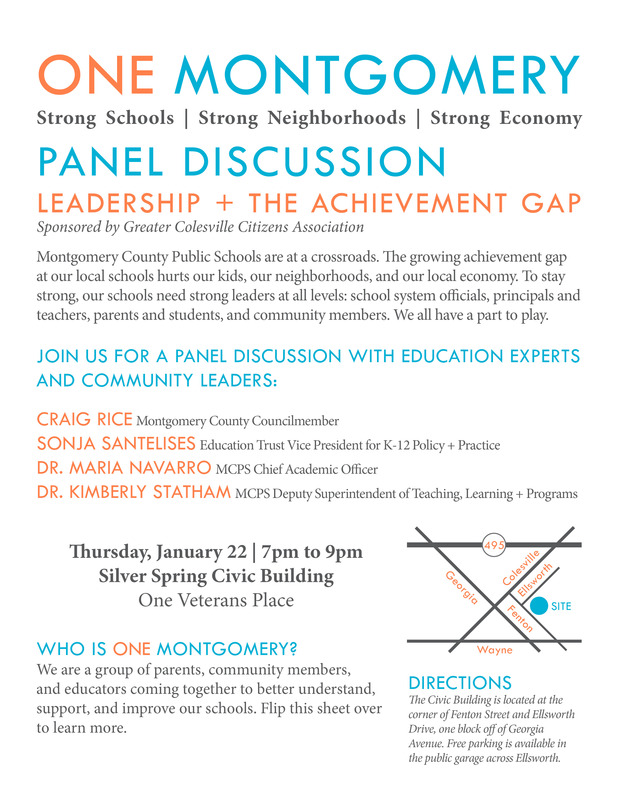 We’ll have a table and would love to meet you and hear your thoughts on Montgomery County schools. Join us from 11am to 3pm at the East County Community Center, located at 3310 Gateshead Manor Way. 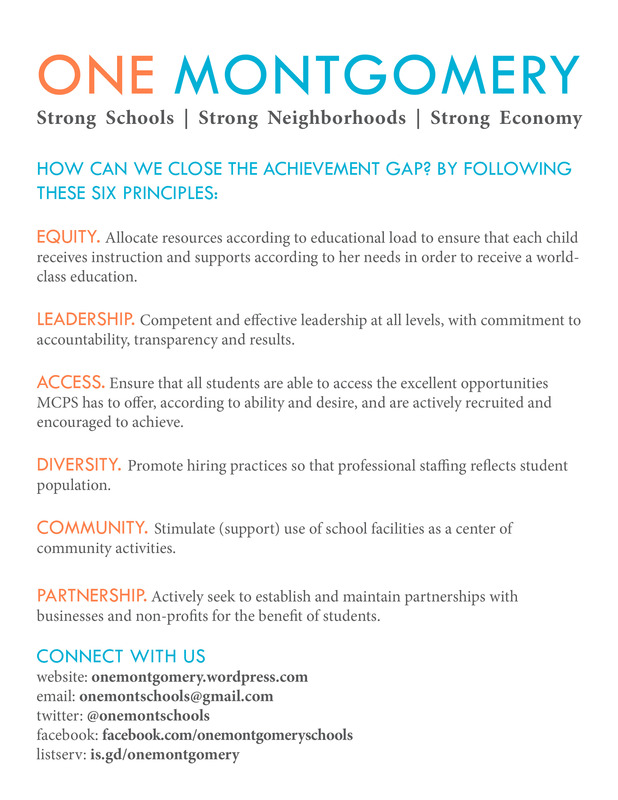 -Help us elect candidates who are committed to school equity! We’re looking for volunteers to help pass out sample ballots at early voting centers. Early voting runs from June 12 to June 19 and we’d like to have people at the Silver Spring Civic Building and Fairland Recreation Center on weekday evenings and weekend mornings. Please email us at onemontschools at gmail dot com if you’re interested in helping. – We won’t be having another community workshop until the fall, but until then, we’re interested in having smaller house meetings where we can get to know the people who are active in local school communities and talk about the issues facing our public schools. Would you be interested in attending or hosting one? Send an email to onemontschools at gmail dot com and let us know. 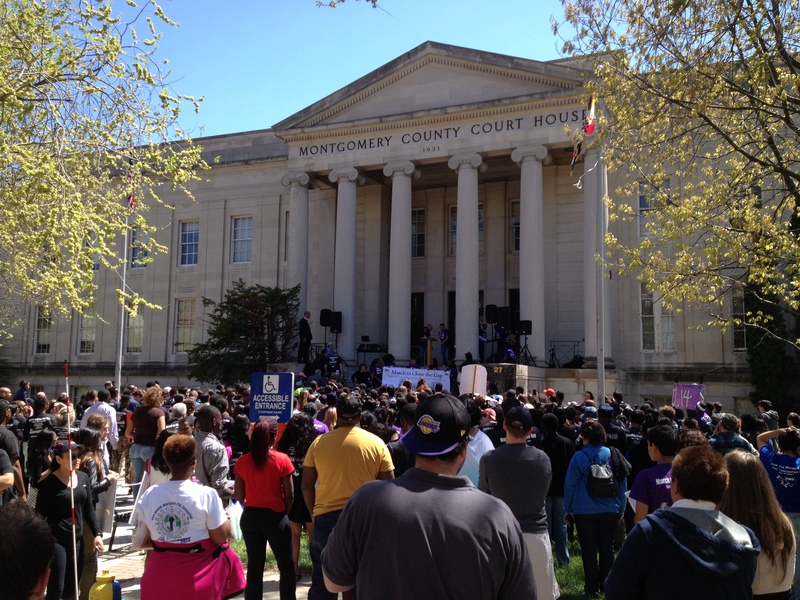 Several hundred people came to march in protest of the achievement gap in Rockville yesterday. Several hundred students, teachers and school administrators, parents, and local officials marched on Rockville yesterday in a call to close the growing achievement gap between white and Asian and black and Hispanic students in Montgomery County Public Schools. The Minority Scholars Program, a student-driven initiative to close the achievement gap, began organizing the march several months ago. 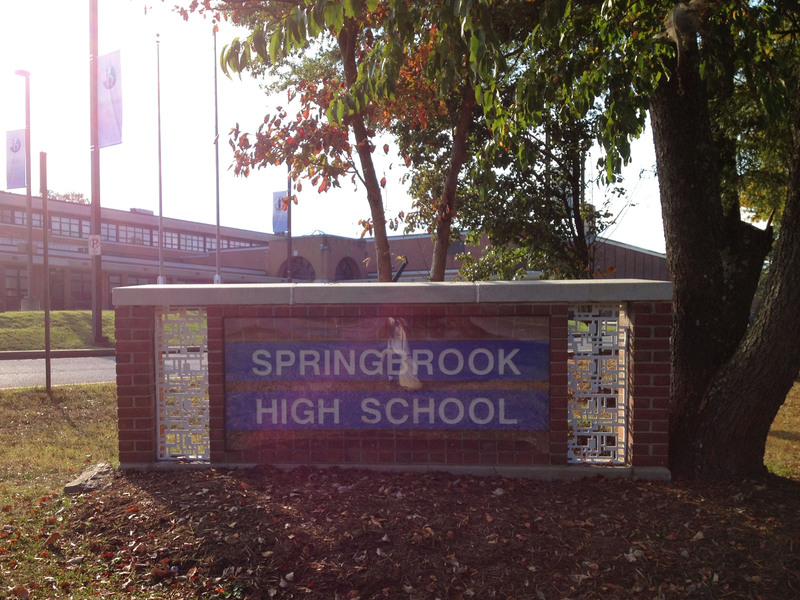 The group began at Walter Johnson High School in Bethesda eight years ago as a way to reach out to minority students, and has since expanded to 10 other high schools in the county, including Northwood, Springbrook, and Wheaton. Organizers say the program has “data to support its success” in increasing the academic eligibility and honor roll placement of minority students. About 400 people marched from the Carver Center, once the county’s black high school under segregation and now the MCPS central office, down Rockville Pike and North Washington Street. Students chanted and held signs with slogans like “Close the Gap,” as drivers honked their horns in approval. The march ended at Courthouse Square for a festive rally on the steps of the county courthouse with music and dancing. Organizers hope the march will raise awareness about the achievement gap and spur the community to action. “For years, we have been watching and waiting and hoping and wishing for something to change,” said Mike Williams, a teacher at Walter Johnson who helped start the Minority Scholars Program. Marchers on Rockville Pike as Dr. Starr (left) takes a photo. Student leader Gabi Bianchi called the march “the beginning of a revolution to close the achievement gap,” adding, “We have been heard.” She said the Minority Scholars Program will advocate for “institutional changes” at the federal, state, and county levels to give students and schools the resources they need to succeed. That will be a challenge for the organization. School officials acknowledge that minority students are lagging their peers, and MCPS does have many good programs in place to help close the gap. But the achievement gap continues to grow and appears to be a direct result of de facto racial and socioeconomic segregation in MCPS. Yet in recent months, Dr. Starr has both rejected a recent report from the county’s Office of Legislative Oversight about the achievement gap, while Starr and Kauffman both threatened to cut funding for additional programs to close the gap if the school system didn’t get a raise in their budget from the county. These actions really raise questions about the school system’s commitment. Yesterday’s march was a great day for the Minority Scholars Project and for all of the hard-working students and staff who made it happen. But we all have to hold MCPS leaders accountable for their promises to listen to the community’s concerns and make the school system more equitable for all students. Check out this slideshow of the march.